I discovered a local indie this past weekend! I went to a local indie art/craft fair yesterday, and DazzleGlaze was set up there. I have been familiar with the brand. We even have a mutual friend, but I never tried the brand or met the maker. I was so excited to see indie polish represented locally! I immediately was attracted to DazzleGlaze's stunning jelly glitters, and purchased a handful. This is one of the colors I picked up. All Night Glow Stick is a deep purple jelly base with green and purple glitters and holo glitters. 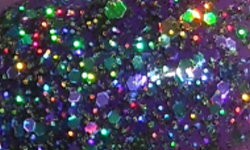 Color: I was immediately attracted to this color because of the contrast between the purple and those bright green glitters. I love this color combination and it's not one I see often with nail polish. I love the amazing sparkle in this, and I love that it's a jelly glitter. Formula: This was a great easy to apply formula. I didn't have any issues with having to fish for glitter. I used 3 coats above. Price: This is $8.00 on the DazzleGlaze website. Overall: I love All Night Glow Stick, the color is very true the name. I love the color combination and the holo sparkle. This is a blingtastic jam-packed glitter polish that makes me very happy. The formula was great and on par too.